Over the last months, I was researching, in my spare time, some ideas to reuse code between Unity projects. I was mainly interested in using generic code from Iron Marines in multiple projects we were prototyping at Ironhide. The target solution in mind was to have something like NPM or Maven where packages are stored in a remote repository, and you can depend on a version of them in any project by just adding a configuration. Some time ago, Unity added the Unity Package Manager (UPM) which does exactly that, it automatically downloads a list of packages given a dependency configuration. I was really excited with this solution since it goes along the direction I wanted. Note: to know more about dependency management follow this link, even though it is about specific dependency manager, it gives the global idea of how they work. So, a good workflow would be something like this. Imagine there are two projects, project A and project B and the first has some useful code we want to use in the second. In order to do that, project A must be uploaded to the dependency system and tagged with a specific version to be identified, for example, version 0.0.1. Then, to import that code in project B, we just add a dependency in the package dependency declaration. And that will download it and now project B can access the new feature. That is basically a common workflow. Since we aren’t Unity, we can’t upload our code to their packages repository (yet?). However, there other are ways to declare dependencies stored elsewhere. For example, project A is stored in a sibling folder to project B. Note: There is a great Gist by LotteMakesStuff about this topic and more (thanks Rubén for the link). This approach has the advantage of using local projects with any structure, stored anywhere (Git or not, more on that later). It even allows depending on a sub folder of project A, so project A could be a complete Unity project with lots of stuff (test scenes, testing assemblies, etc) but project B only depends on the shared code. It needs all developers to use a similar folder structure for all the projects and download all of them together to work. Transitive dependencies is not supported by UPM following this approach, so if project A depends on project Zero, project B would never automatically find out. It has some unexpected behaviors in code, at least in Visual Studio, when editing project A (add new code, refactor, etc) by opening project B solution through Unity. That's is probably a side effect on how they create the VS solution or may be just a bug. It doesn't support versioning. Each time project A is modified, project B will automatically know about the change. This could be an issue if project A changed its API and we don't want to (or can't) update project B yet. Dependencies can be stored directly in Git projects (in Github or any other Git server). It supports depending on a specific commit, branch or tag to simulate versioning, but changing versions should be done by hand since UPM doesn't show the list of versions like it does with Unity packages. Since it looks at the root folder, a different Git project is needed for each dependency. This is not necessary a bad thing, but it is not possible to have a Git project with multiple folders, one for each project, something that might be common in some cases, like we did with our LibGDX projects. A bigger problem related to this is that project A should have only the code to be used by other projects, otherwise UPM will import everything. It also lacks support for transitive dependencies since UPM doesn't process the dependencies declaration of the Git project. UPDATE: this is a great tutorial on using git as package provider. There is also a mix using filesystem reference and Git submodules to overcome the versioning disadvantage of the first approach. For example, project A is downloaded as project B submodule structure pointing to specific branch/tag/commit. In this way, we have specific versions of project A in each project, and we can share code by uploading it to Git to that submodule and tagging versions. We still have the transitive dependency limitation, and other problems related to Git submodules (more on that later). This approach is similar to using Unity's packages but a remote repository in a private server is needed to share code among developers. It is also possible to upload the code to a public server like NPM. Obviously, a private server need maintenance but I believe it is the long term solution if you have private code you can't share with the world. At Gemserk we had our own repository using Nexus and at some point we even uploaded some of our dependencies to Maven central. We configured it when we started making games and probably touched once or twice per year, maintenance wasn't a problem at all. I tried to use version range with UPM to see if I can add a dependency to a package 1.0.x and that would automatically download latest 1.0 (for example, 1.0.26) but couldn't make it work, not sure if it is not supported yet or I am doing it wrong. UPDATE: it is not supported yet but it is going to be in the long term plan. With this approach, project A is integrated like any Unity's package and the code is accessible in the VS solution but it can't be easily modified through project B. Any changes in project A should be made apart, a new version must be uploaded to the repository and then update project B dependency declaration. In some cases this shouldn't be an issue but, for some development cycles, it could. Note: When we used Maven, there was a concept of SNAPSHOT which is a work in progress version that it is overwritten each time it is uploaded to the dependency system and projects depending on it use latest version automatically. That was super useful for development and the reason I tested version ranges with UPM. UPDATE: I tested creating a packages server using Verdaccio and see how UPM interacts with it, and how hard it was to upload a package to the server. It turns out that it is relatively simple, UPM shows the list of available versions and probably get transitive dependencies (didn't test that yet). I followed this tutorial in case you want to test it too. After that initial research and considering some of the current limitations of the UPM, I started looking for other options as well. In this approach, code is imported using a Git submodule in the project B itself. Following this approach the code is more integrated, changes can be made and uploaded to that submodule directly from project B. In case there are different versions, project B can depend on specific branch/tag/commit of that submodule too. Similar to the Git + UPM approach, the submodule should contain only the stuff needed to be reused, otherwise it will import it too since submodules point to the root folder of the Git project. However, since it is integrated in the other projects, it should be easier to edit in some way. It is an interesting approach but has some drawbacks as well, for example, having to update each Git submodule manually by each developer, or the root folder problem. There is an ultimate form of reusing code: copy and paste the code from project to project. Even though it is ugly and doesn't scale at all, it might work when having to do some quick tests. Whatever the chosen way of sharing code, first it must be decoupled in a nice way and that's what I'm planning to write about in the next blog post. That was my research for now, there are a lot of links to keep digging in the UPM solution. I hope they keep improving it to support transitive dependencies for filesystem and git approaches and version ranges. For the last 3 years, I've been working on Iron Marines at Ironhide Game Studio, a Real time Strategy Game for mobile devices. During its development, we created a Fog of War solution that works pretty well for the game but it lacks some of the common features other RTS games have, and how to improve that is something I wanted to learn at some point in my life. Recently, after reading a Riot Games Engineering blog post about Fog of War in League of Legends, I got motivated and started prototyping a new implementation. 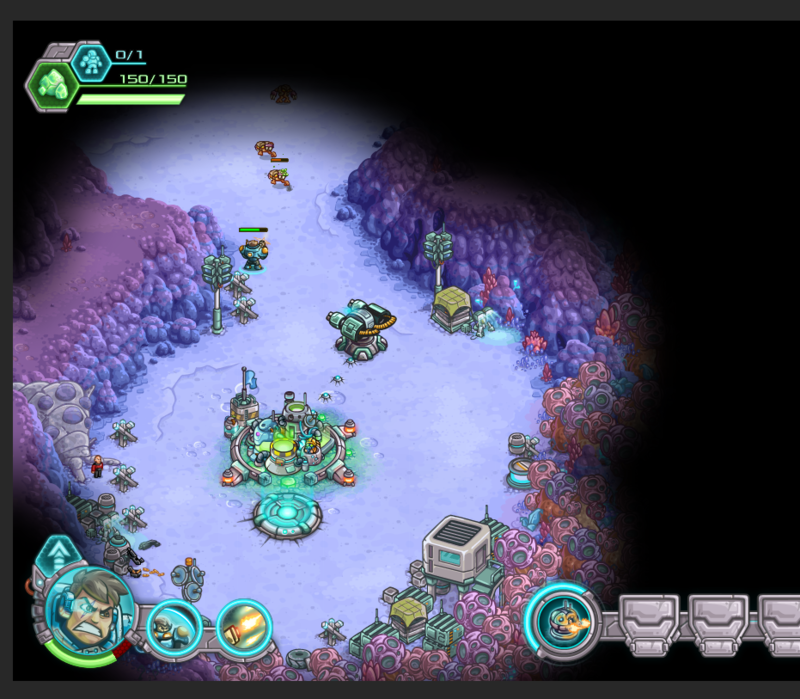 In this blog post I will explain Iron Marines' Fog of War solution in detail and then I will write another blog post about the new solution and explain why I consider it is better than the first one. It normally represents the missing information about the battle, for example, not knowing how the terrain is yet, or outdated information, for example, the old position of an enemy base. 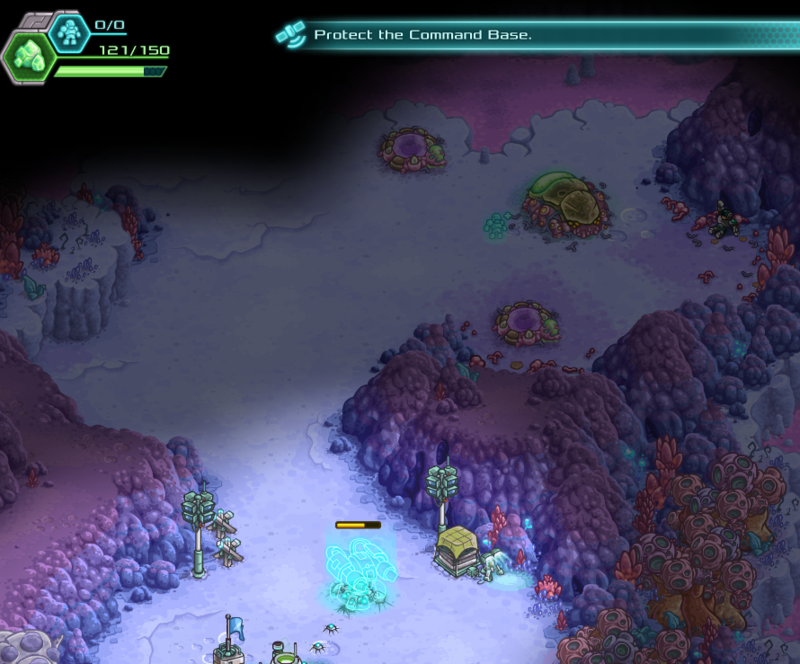 Player units and buildings provide vision that removes Fog during the game revealing information about the terrain and the current location and state of the enemies. Example: Dune 2 and its Fog of War representing the unknown territory (by the way, you can play Dune 2 online). 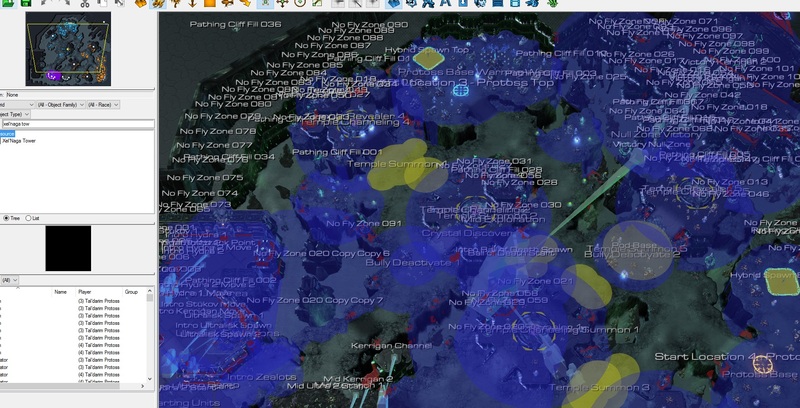 Example: Warcraft: Orcs and Humans' Fog of War (it seems you can play Warcraft online too). The concept of Fog of War is being used in strategy games since more than 20 years now, which is a lot for video games. We started by researching other games and deciding what we wanted before start implementing anything. After that, we decided to target a similar solution to Starcraft (by the way, it is free to play now, just download Battle.net and create an account). 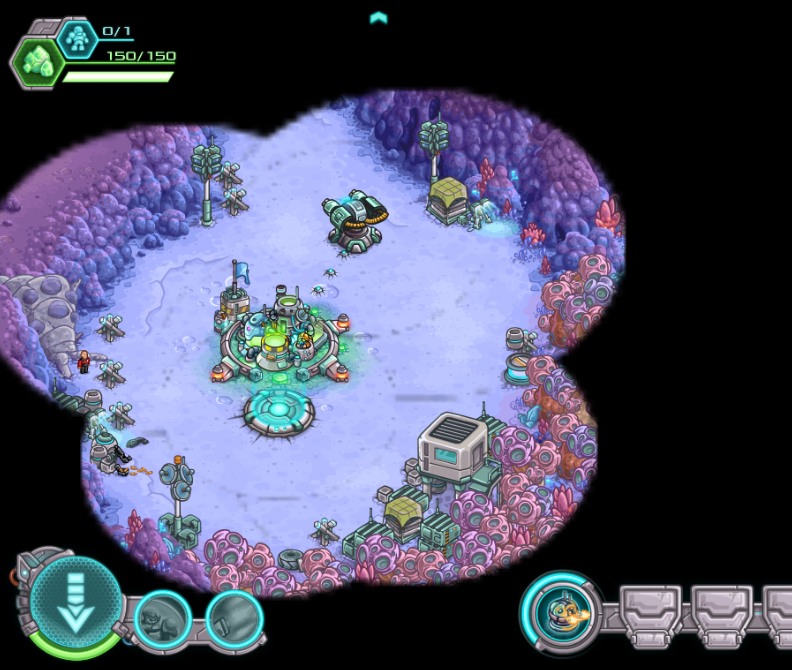 In that game, units and buildings have a range of vision that provide vision to the Player. 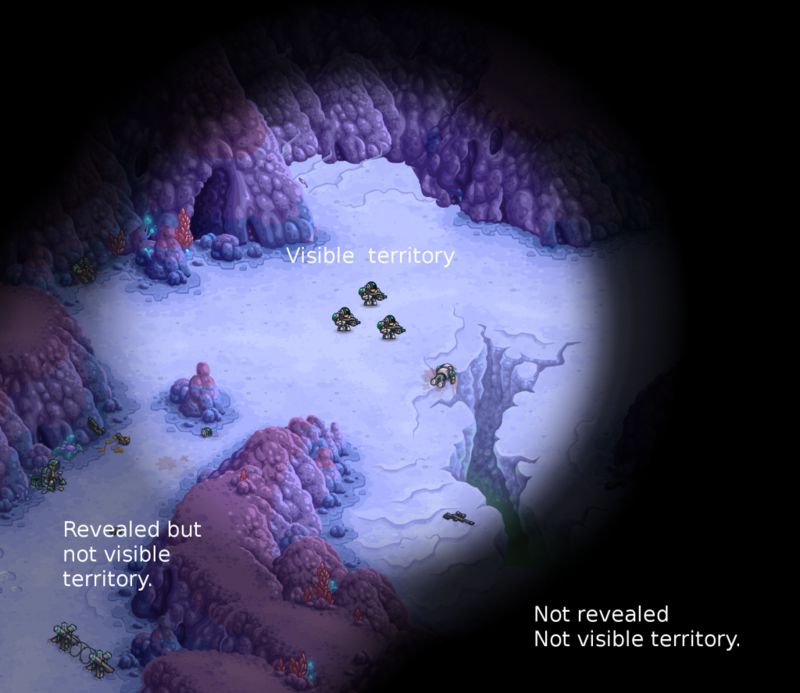 Unexplored territory is covered with full opacity black fog while previously explored territory is covered by half opacity fog, revealing what the Player know about it, information that doesn't change during the game. 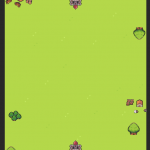 Enemy units and buildings are visible only if they are inside Player's vision but buildings leave over a last known location after they are not visible anymore. I believe the main reason for that they can't normally move (with the exception of some Terran buildings) so it is logical to assume they will stay in that position after losing vision and might be vital information about the battle. Given those rules, we created mock images to see how we wanted it to look in our game before started implementing anything. Mock Image 1: Testing terrain with different kind of Fog in one of the stages of Iron Marines. 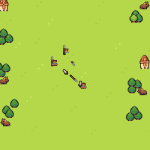 Mock Image 2: Testing now with enemy units to see when they should be visible or not. Mock Image 3: Just explaining what each Fog color means for the Player's vision. We started by prototyping the logic to see if it works for our game or not and how we should adapt it. 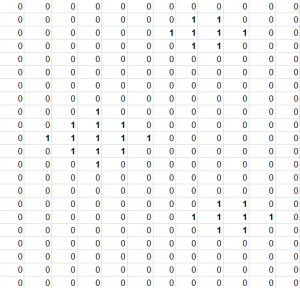 For that, we used an int matrix representing a discrete version of the game world where the Player's vision is. A matrix's entry with value 0 means the Player has no vision at that position and a value of 1 or greater means it has. Image: in this matrix there are 3 visions, and one has greater range. Units and buildings' visions will increment 1 to the value of all entries that represent world positions inside their vision range. Each time they move, we first decrease 1 from its previous position and then we increment 1 in the new position. 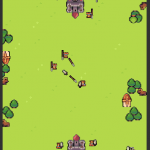 We have a matrix for each Player that is used for showing or hiding enemy units and buildings and for auto targeting abilities that can't fire outside Player's vision. To determine if an enemy unit or building is visible or not, we first get the corresponding entry of the matrix by transforming its world position and check if the stored value is greater than 0 or not. If not, we change its GameObject layer to one that is culled from the main camera to avoid rendering it, we named that layer "hidden". If it is visible, we change it back to the default layer, so it starts being rendered again. Image: shows how enemy units are not rendered in the Game view. I explain later why buildings are rendered even outside the Player's vision. This allowed us to prototype and decide some features we didn't want. In particular, we avoided blocking vision by obstacles like mountains or trees since we preferred to avoid the feeling of confinement and also we don't have multiple levels of terrain like other games do. I will talk more about that feature in the next blog post. After we knew what we wanted, and tested in the game for a while, we decided to start improving the visual solution. The improved version consists in rendering a texture with the Fog of War over the entire game world, similar to what we did when we created the visual mocks. For that, we created a GameObject with a MeshRenderer and scaled it to cover the game world. That mesh renders a texture named FogTexture, which contains the Fog information, using a Shader that considers pixels' colors as an inverted alpha channel, from White color as full transparent to Black color as full opaque. Now, in order to fill the FogTexture, we created a separated Camera, named FogCamera, that renders to the texture using a RenderTexture. For each object that provides vision in the game world, we created a corresponding GameObject inside the FogCamera by transforming its position accordingly and scaling it based on the vision's range. 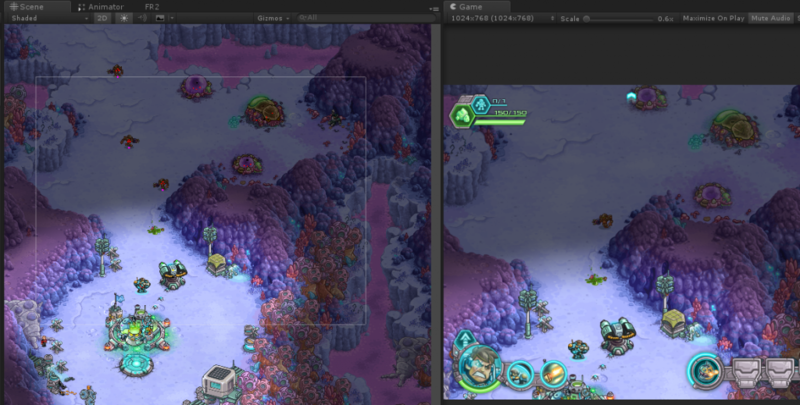 We use a separated Unity's Layer that is culled from other cameras to only render those GameObjects in the FogCamera. 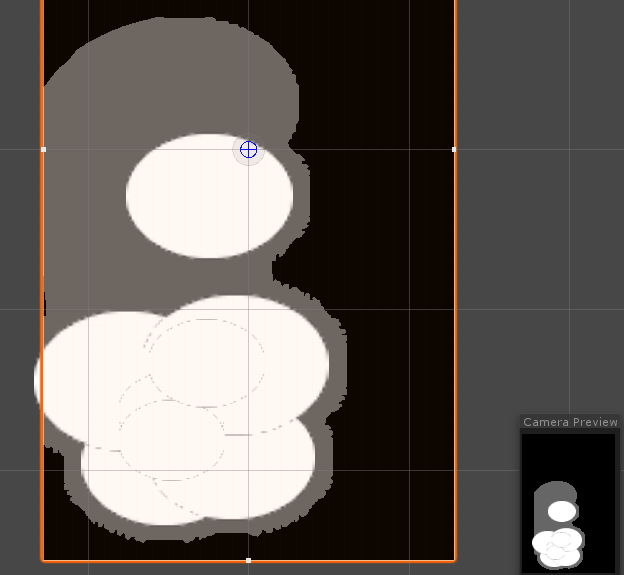 To complete the process, each of those objects have a SpriteRenderer with a small white Ellipse texture to render white pixels inside the RenderTexture. 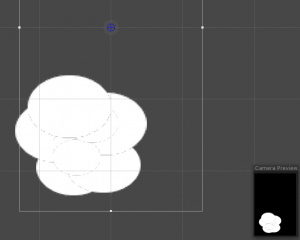 Note: we use an Ellipse instead of a Circle to simulate the game perspective. Image: This is the texture used for each vision, it is a white Ellipse with transparency (I had to make the transparency opaque so the reader can see it). 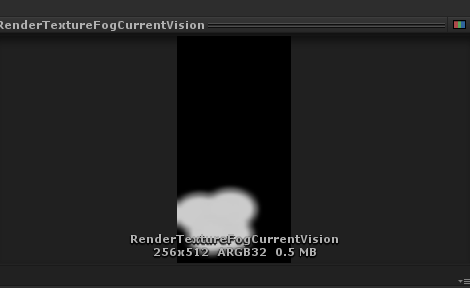 Image: this is an example of the GameObjects and the FogCamera. For the purpose of rendering previously revealed territory, we had to add a previous step to the process. In this step, we configured another camera, named PreviousFogCamera, using a RenderTexture too, named PreviousVisionTexture, and we first render the visions there (using the same procedure). The main difference is that the camera is configured to not clear the buffer by using the "Don't Clear" clear flag, so we can keep the data from previous frames. Image: it shows the revealed territory in the FogCamera. 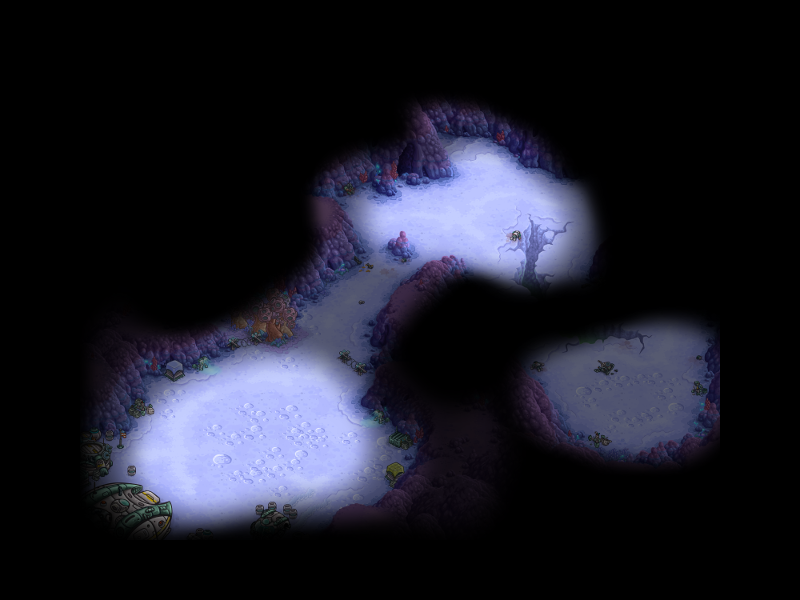 Image: and here is an example of how the Fog with previous revealed territory looks in the game. Since buildings in Iron Marines are big and they don't move like Starcraft, we wanted to follow a similar solution. In order to do that, we identified buildings we wanted to show below the Fog by adding a Component and configuring they were going to be rendered when not inside the Player's vision. 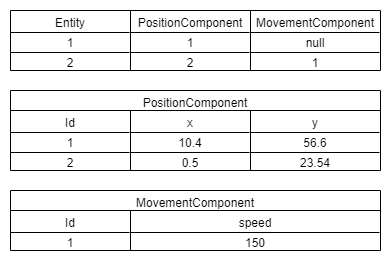 Then, there is a System that, when a GameObject with that Component enters the Player's vision for the first time, it creates another GameObject and configures it accordingly. That GameObject is automatically turned on when the building is not inside the Player's vision anymore and turned off when the building is inside vision. If, by some reason the building was destroyed while not in inside vision, the GameObject doesn't disappear until the Player discovers its new state. 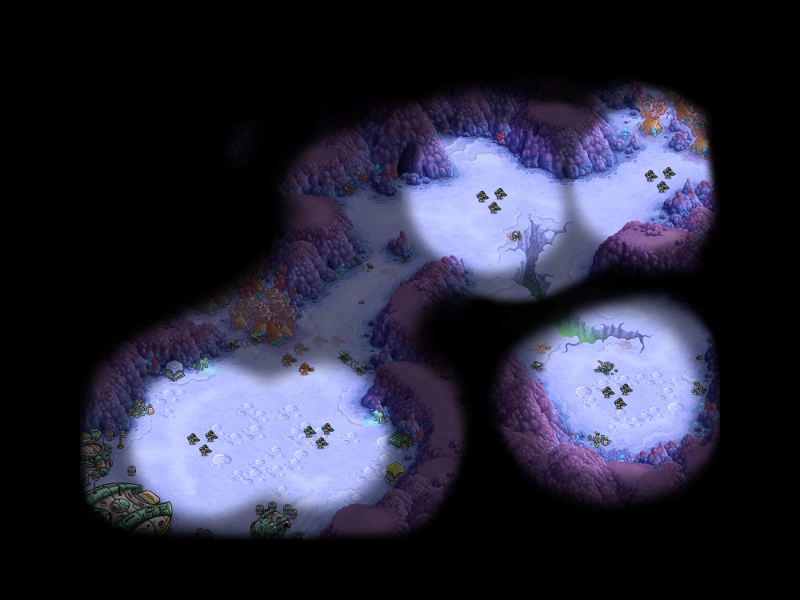 Our solution lacks some of the common Fog of War features but it works perfectly for our game and looks really nice. It also performed pretty well on mobile devices, which is our main target, and if not done properly it could have affected the game negatively. We are really proud and happy with what we achieved developing Iron Marines. That was, in great part, how we implemented Fog of War for Iron Marines. I hope you liked both the solution and the article. In the next blog post I will talk more about the new solution which includes more features. There is a Unity Unite talk named "Unite Europe 2017 - Squeezing Unity: Tips for raising performance" by Ian Dundore about things you can do in your game to improve Unity performance by explaining how Unity works behind the scenes. Update: I just noted (when I was about to complete the post) there is another talk by Ian from Unite 2016 named "Unite 2016 - Let's Talk (Content) Optimization", which has other good tips as well. There are two techniques to improve Unity UI performance we use at work they didn’t mention in the video and we want to share them in this blog post. One of them is using CanvasGroup component and the other one is using RectMask2D. CanvasGroup component controls the alpha value of all the elements inside in its RectTransform hierarchy and whether that hierarchy handle input or not. The first one is mainly used for render purposes while the second one for user interaction. What is awesome about CanvasGroup is, if you want to avoid rendering a hierarchy of elements, you can just put alpha in 0 and that will avoid sending it to render queue improving gpu usage, or at least that is what the FrameDebugger and our performance tests say. If you also want to avoid that hierarchy to consume events from the EventSystem, you can turn off the block raycast property and that will avoid all the raycast checks for its children, improving cpu usage. The combination of those two is important. It is also easier and more designer friendly than iterating over all the children with CanvasRender and disable them. Same thing to disable/enable all objects handling raycasts. In our case, at work, we are using multiple Canvas objects and have all of them “disabled” (not being rendered nor handling input) using CanvasGroup alpha and block raycasts properties. 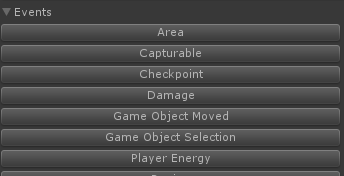 That improves a lot the speed of activating and deactivating our metagame screens since it avoids regenerating the mesh and calculating layout again which GameObject SetActive() does. The idea when using masks it to hide part of the screen in some way, even using particular shapes. We use masks a lot at work in the metagame screens, mainly to show stuff in a ScrollRect in a nice way. We started using just Mask component, with an Image without Sprite set, to crop what we wanted. Even though it worked ok, it wasn’t performing well on mobile devices. After investigating a bit with FrameDebugger we discovered we had tons of render calls of stuff that was outside the ScrollRect (and the mask). Since we are just using rectangle containers for those ScrollRects, we changed to use RectMask2D instead. For ScrollRects with a lot of elements, that change improved enormously the performance since it was like the elements outside the mask weren’t there anymore in terms of render calls. This was a great change but only works if you are using rectangle containers, doesn’t work with other shapes. Note that the Unity UI Mask tutorial only shows image masks and doesn't say anything about performance cost at all (it should). Note: when working with masks there is a common technique of adding something over the mask to hide possible ugly mask borders, we normally do that on all our ScrollRect that doesn't cover all the screen. There is another one, a hack, we call it the Touch Hack. It is a way to handle touch all over the screen without render penalty, not sure it is a great tip but it helped us. The first thing we thought when handling touch all over the screen (to do popup logic and/or block all the other canvases) was to use an Image, without Sprite set, expanded to all the screen with raycast enabled. That worked ok but it was not only breaking the batch but also rendering a big empty transparent quad to all the screen which is really bad on mobile devices. Our solution was to change to use a Text instead, also expanded to all the screen but without Font nor text set. It doesn’t consume render time (tested on mobile devices) and handles the raycasts as expected, I suppose it is because it doesn’t generate the mesh (since it doesn’t have text nor font set) and at the same time still has the bounding box for raycasts configured. It is really important to have good tools to detect where the problems are and a way to know if you are improving or not. We use a lot the FrameDebugger (to see what was being drawn, how many render calls, etc), the overdraw Scene view and the Profiler (to see the Unity UI CPU cost). Hope these tips could help when using Unity UI to improve even more the performance of your games. When working on Iron Marines engine at work we did some research on other RTS games in order to have more knowledge on how they did some stuff and why. 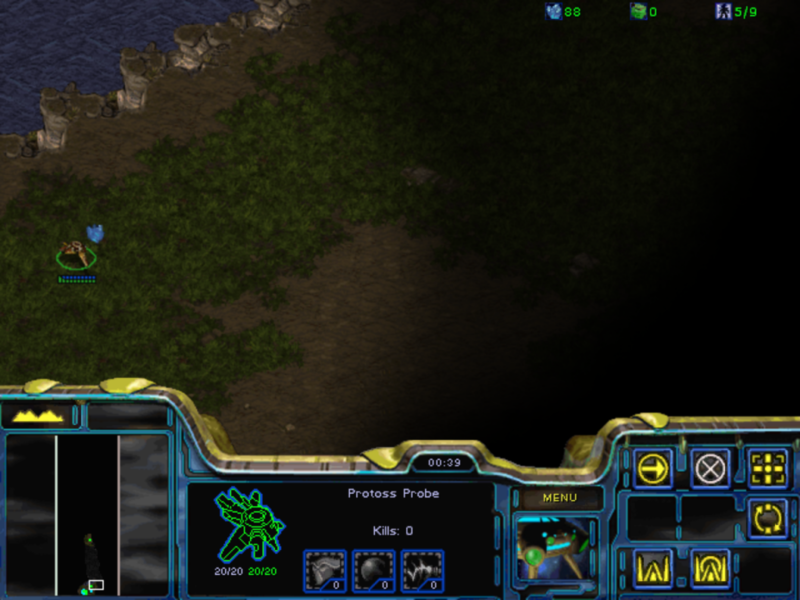 In this post, in particular, I want to share a bit of my research on the SC2 Editor which helped a lot when making our own editor. 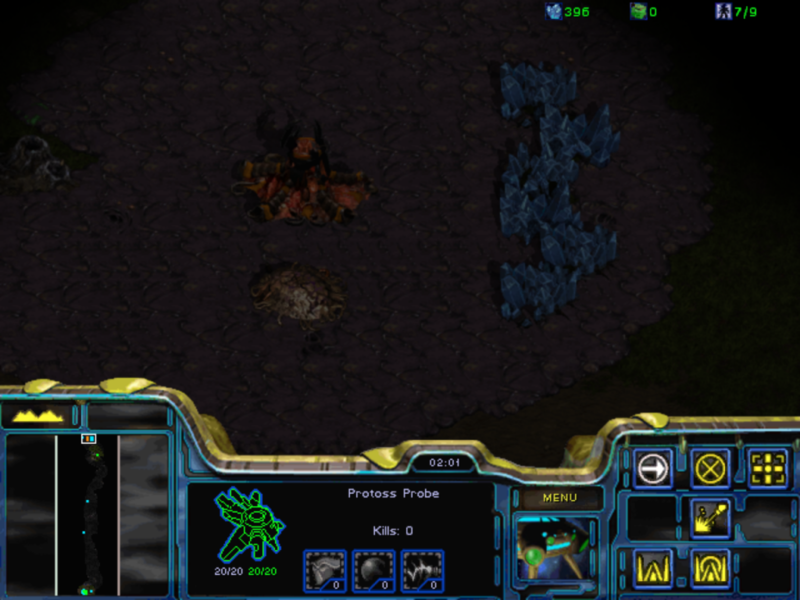 The objective was to see what a Game Designer could do or not with the SC2 Editor in order to understand some decisions about the editor and the engine itself. 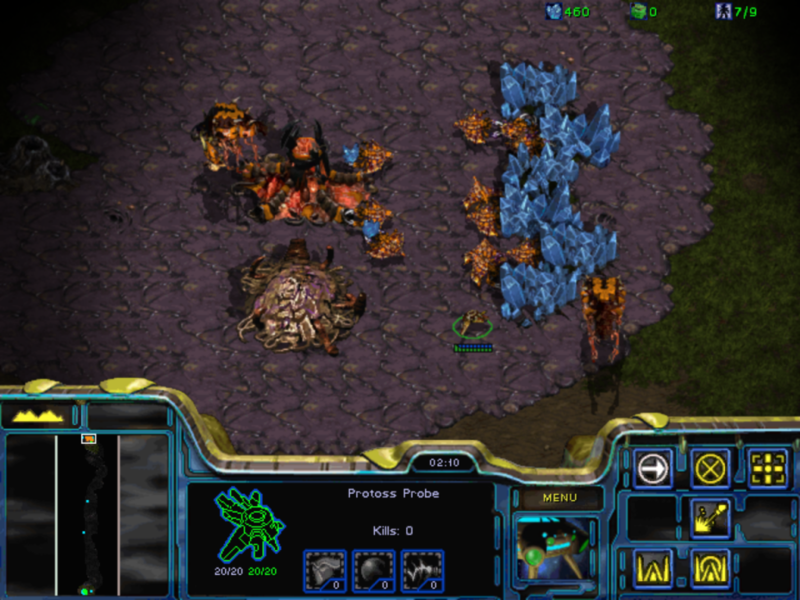 Obviously, by taking a look at the game mods/maps available it is clear that you could build entire games over the SC2 engine, but I wanted to see the basics, how to define and control the game logic. 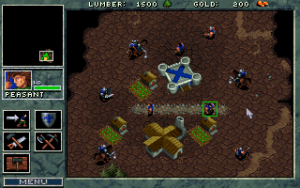 As a side note, I love RTS games since I was a child, I played a lot of Dune 2 and Warcraft 1. I remember playing with the editors of Command & Conquer and Warcraft 2 also, it was really cool, so much power 😉 and fun. With one of my brothers, each one had to make a map and the other had to play and beat it (we did the same with Doom and Duke Nukem 3d editors). 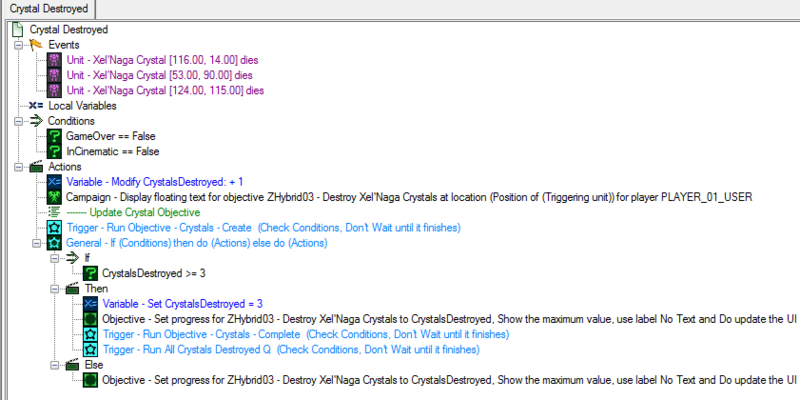 SC2 maps are built with Triggers which are composed by Events, Conditions and Actions to define parts of the game logic. There are a lot of other elements as well that I will talk a bit after explaining the basics. The Triggers are where the general map logic is defined. They are triggered by Events and say which Actions should be performed if given Conditions are met. Even though behind the scenes the logic is C/C++ code and it is calling functions with similar names, the Editor shows it in a natural language like “Is Any Unit of Player1 Alive?” which helps for quick reading and understanding. Actions are executed when the event happened and the conditions are met. They could be anything supported by the editor, from ordering a structure to build a unit to showing a mission objective update on screen, among other things. This example shows an action that enqueues to unit "BadGuy" an attack order with unit "SpecialMarine" as target, replacing existing enqueued orders in that unit. There is another action after that which turns off the Trigger in order to avoid processing its logic again. The idea with this approach is to build the logic in a descriptive way, the Game Designer has tools to fulfill what he needs in terms of game experience. For example, he needs to make it hard to save a special unit when you reach its location, then he sends a wave of enemies to that point. Even though it is really basic, download my example if you want to test it 😛 . It shows picking a Unit from units in the map (created instances). It shows Unit picking from different functions that return a Unit. This allows the Game Designer to adapt, in part, the logic to what is happening in the game while keeping the main structure of the logic. For example, I need to make the structures of Player2 explode when any Unit of Player1 is in Region1, I don’t care which unit I only care it is from Player1. There are different elements that help the Game Designer when creating the map: Regions, Points, Paths and Unit Groups, among others. These elements are normally not visible by the Player but are really useful to the Game Designer to have more control over the logic. As said before, the SC2 Editor is pretty complete, it allows you to do a lot of stuff, from creating custom cutscenes to override game data to create new units, abilities, and more but that's food for another post. The first try of creating some kind of editor for our game wasn't so successful. Without the core of the game clearly defined we tried to create an editor with a lot of the SC2 Editor features. We spent some days defining a lot of stuff in abstract but in the end we aimed too far for a first iteration. So, after that, we decided to start small. We starting by making a way to detect events over the "being defined core" at that point. 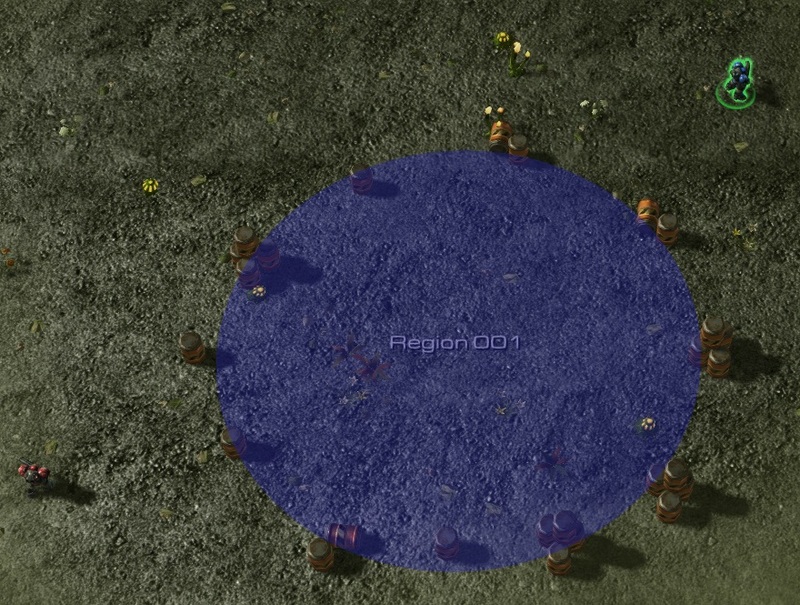 An event could be for example: "when units enter an area" or "when a resource spot was captured by a player". Note: Even though they are Events we named them Triggers (dunno why), so AreaTrigger is an empty Trigger in terms of SC2 Editor with just an Event. 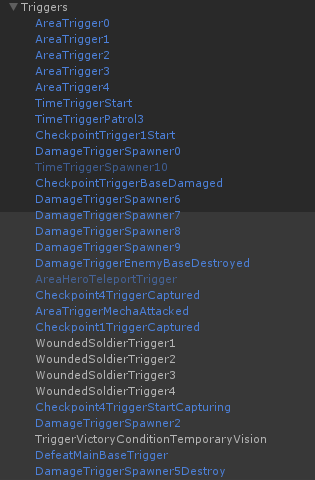 Events were the only thing in the editor, all the corresponding logic was done in code in one class, corresponding to that map, which captures all events and checks conditions for taking some actions, normally, sending enemies to attack some area. The actions were separated from the level design which played against the iteration cycle (at some point our project needed between 10 and 15 seconds to compile in the Unity Editor). Since it needs code to work, it requires programming knowledge and our team Game Designers aren't so good with code. The second (and current) version is more Game Designer friendly, and tends to be more similar to SC2 Editor. 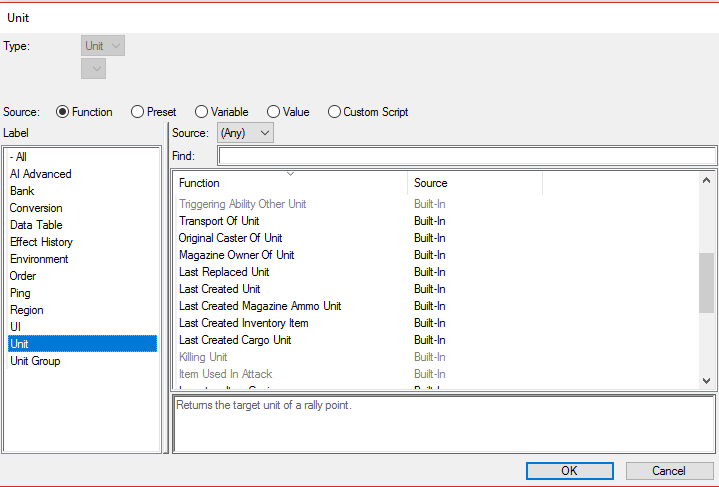 Most of the logic is defined in the editor within multiple triggers. 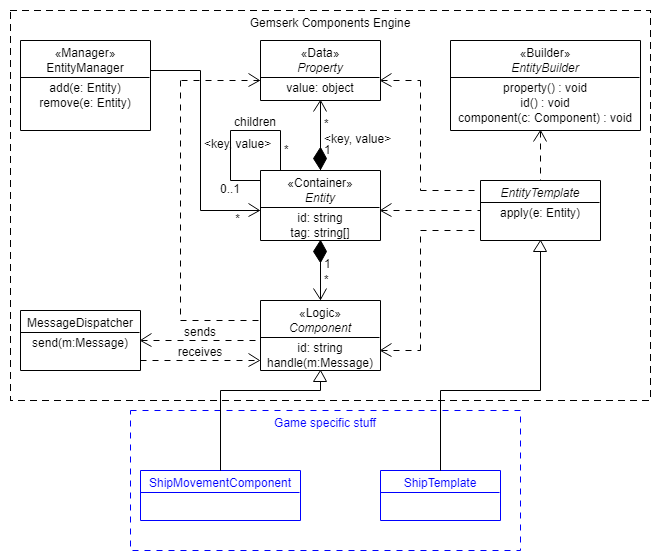 Each Trigger is defined as a hierarchy of GameObjects with specific components to define the Events, Conditions and Actions. 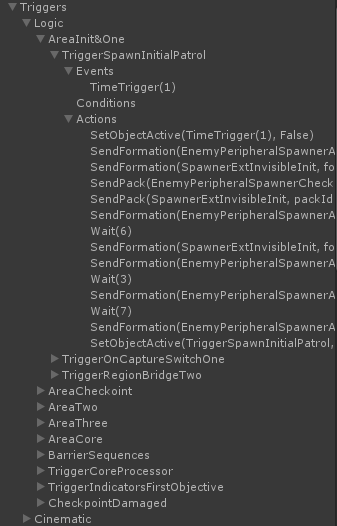 This declares for example a trigger logic that is activated by time, it has no conditions (so it executes always given the event) and it sends some enemies in sequence and deactivates itself at the end. Unity allow us to pick a Capturable element (CapturableScript in this case) from the scene. 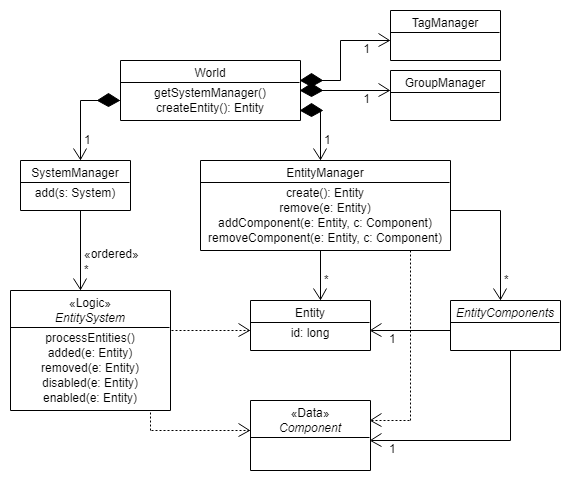 This simplifies a lot the job of configuring the map logic. 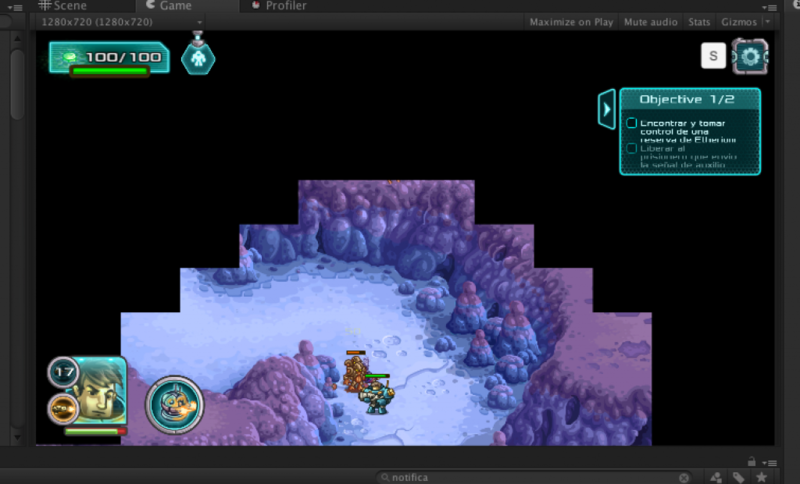 Some common conditions could be to check if a resource spot is controlled by a given player or if a structure is alive. 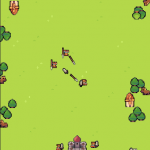 Common actions could be, send a wave of enemy units to a given area or deactivate a trigger. The base code is pretty simple, it mainly defines the API while the real value of this solution is in the custom Events, Conditions and Actions. Visual, and more Game Designer friendly (it is easier for Programmers too). Faster iteration speed, now we can change things in Editor directly, even in runtime! Easily extensible by adding more Events, Conditions and Actions, and transparent to the Game Designers since they are automatically shown in our Custom Editor. Take advantage of Unity Editor for configuring stuff. 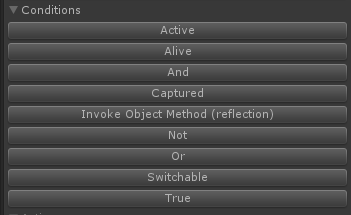 Easy to disable/enable some logic by turning on/off the corresponding GameObject, which is good for testing something or disable one logic for a while (for example, during ingame cinematics). More control to the Game Designer, they can test and prototype stuff without asking programming team. 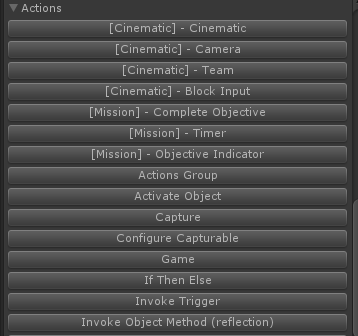 Simplified workflow for our ingame cinematics. Compatible with our first version, both can run at the same time. Merge the stage is harder now that it is serialized with the Unity scene, with code we didn’t have merge problems or at least it was easier to fix. One of the ideas to simplify this is to break the logic in parts and use prefabs for those parts, but it breaks when having links with scene instances (which is a common case). A lot of programming responsibility is transferred to the scripting team which in this case is the Game Design team, that means possibly bad code (for example, duplicated logic), bugs (forget to turn off a trigger after processing the actions) and even performance. When designing (and coding) a game, it is really important to have a good iteration cycle in each aspect of the game. Having switched to a more visual solution with all the elements at hand and avoiding code as much as we could, helped a lot with that goal. Since what we end up doing looks similar to a scripting engine, why didn't we go with a solution like uScript or similar in the first place? the real answer is I didn't try in depth other Unity scripting solutions out there (not so happy with that), each time I tried them a bit they gave me the feeling it was too much for what we needed and I was unsure how they perform on mobile devices (never tested that). 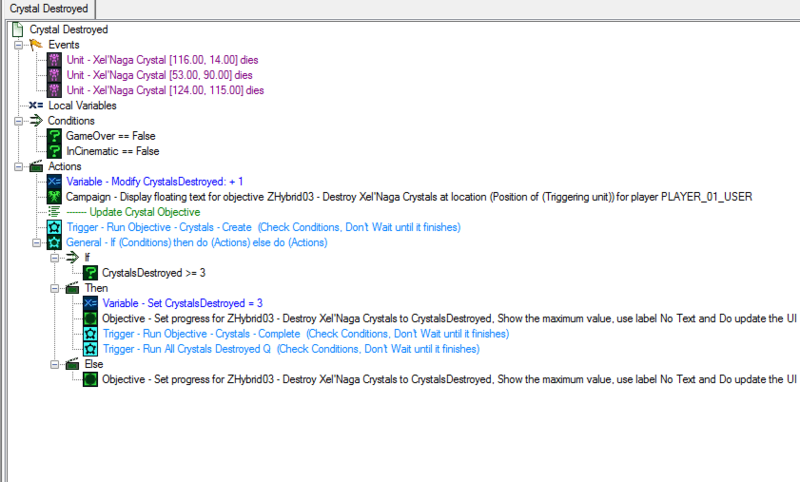 Also, I wasn't aware we would end up need a scripting layer, so I prefered to evolve over our needs, from small to big. Taking some time to research other games and play with the SC2 Editor helped me a lot when defining how our engine should work and/or why we should go in some direction. There are more aspects of our game that were influenced in some way by how other RTS games do it, which I may share or not in the future, who knows. I love RTS games, did I mention that before? I’m not inventing anything new here, I just want to share how making mockups and prototypes helped me to clarify and minimize some problems and in some cases even solve them with almost no cost. For prototypes and mockups I'm using the Superpower Assets Pack of Sparklin Labs which provided me a great way of start visualizing a possible game. Thank you for that guys. I will start talking about how I used visual mockups to quickly iterate multiple times over the layout of the user interface of my game to remove or reduce a lot of unknowns and possible problems. After that, I will talk about making quick small prototypes to validate ideas. One of them is about performing player actions with a small delay (to simulate networking latency) and the other one is about how to solve each player having different views of the same game world. For the game I’m making the player's actions were basically clear but I didn't know exactly how the UI was going to be and considering I have small experience making UIs, having a good UI solution is a big challenge. 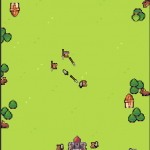 In the current game prototype iteration, the players only have four actions, build unit, build barracks, build houses and send all units to attack the other player. At the same time, to perform those actions, they need to know how much money they have, available unit slots and how much each action cost. To start solving this problem, I quickly iterate through several mockups, made directly in a Unity scene and using a game scene as background to test each possible UI problem case. For each iteration I compiled it to the phone and "test it" by early detecting problems like "the buttons are too small" or "can't see the money because I am covering it with my fingers", etc. Why did I use Unity while I can do it with any image editing application and just upload the image to the phone? Well, that's is a good question, one of the answers is because I am more used to do all these stuff in Unity and I already have the template scenes. The other answer is because I was testing, at the same time, if the Unity UI solution supported what I was looking for and I could even start testing interaction feedback, like how the button will react when touched, if the money will turn to red when not having anymore, etc, something I could not test with only images. The following gallery shows screenshots of different iterations where I tested button positions, sizes, information and support for possible future player actions. I will not go in detail here because I don't remember exactly the order nor the test but you could get an idea by looking at the images. ui with different game world scale. It took me like less than 2hs to go through more than 10 iterations, testing even visual feedback by discovering when testing that the player should quickly know when some action is disabled because of money restriction or not having unit slots available, etc. I even have to consider changing the scale of the game world to give more empty space reserved for the UI. When playing network games, one thing that was a possible issue in my mind is that the player should receive feedback instantly even though the real action could be delayed a bit to be processed in the server. In the case of a move unit action in a RTS, the feedback could be just an animation showing the move destination and process the action later, but when the action considers a consuming a resource, that could be a little tricky, or at least I wasn’t sure so I decided to make a quick test for that. 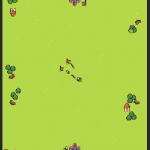 Similar to the other, I created a Unity scene, in a separated project, I wanted to iterate really fast on this one. The idea to test was to have a way of processing part of the action in the client side to validate the preconditions (enough money) and to give the player instant feedback, and then process the action when it should. After analyzing it a bit, my main concern was the player experience on executing an action and receiving instant feedback but watching the action was processed later, so I didn’t need any networking related code, I could test everything locally. The test consisted in building white boxes with the right mouse button, each box costs $20 and you start with $100. So, the idea is that in the moment the button is pressed, a white box with half opacity appears giving the idea the action was processed and $20 are consumed, so you can’t do another action that needs more than that money. After a while, the white box is built and the preview disappear. In the case of a server validating the action, it will work similar, the only difference is that the server could fail to validate the action (for example, the other player stole money before), in that case the player has to cancel it. So the next test was to try to process that case (visually) to see how it looks like and how it feels. The idea was similar to the previous case but after a while the game returns the money and the box preview disappears. It shouldn't be a common case but this is one idea on how it could be solved and I don’t think it is a bad solution. The problem I want to solve here is how each player will see the world. Since I can't have different worlds for each player the idea is to have different views of the same world. In the case of 3d games, having different cameras should do the trick (I suppose) but I wasn't sure if that worked the same way for a 2d game, so I have to be sure by making a prototype. One thing to consider is that, in the case of the UI, each player should see their own actions in the same position. Since UI should be unique for each player I configured each canvas for each camera and used the culling mask to show one or another canvas. Again, this test was really simple and quick, I believe I spent like 30 mins on it, the important thing is that I know this is a possible (and probably the) solution for this problem, which before the test I wasn't sure if it was a hard problem or not. One good thing about making prototypes is that you could do a lot of shortcuts or assume stuff since the code and assets are not going to be in the game, that gives you a real fast iteration time as well as focus on one problem at a time. For example, by testing the mockups I added all assets in one folder and used Unity sprite packer without spending time on which texture format should I use for each mobile platform or if all assets can be in one texture or not, or stuff like that. Making quick prototypes of things that you don't know how to solve, early, gives you a better vision of the scope of problems and it is better to know that as soon as possible. Sometimes you could have a lead on how to solve them and how expensive the solution could be and that gives you a good idea on when you have to attack that problem or if you want it or not (for example, forget about a specific feature). If you can't figure it out possible solutions even after making prototypes, then that feature is even harder than you thought. Prototyping is cheap and it is fun because it provides a creative platform where the focus is on solving one problem without a lot of restrictions, that allows developing multiple solutions, and since it is a creative process, everyone in game development (game designers, programmers, artists, etc) could participate. The idea of this post is to analyze in a superficial way the multiplayer solution behind Clash Royale. Before starting the analysis, you must know that I don’t have previous experience making multiplayer games, I am just learning, and all the analysis done here is just a theory. 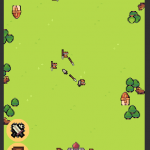 So, you surely know about Clash Royale but in case you don’t, it is an online multiplayer 1v1 RTS game where the first player to destroy the other’s towers win. To do so, they play cards which transforms into units that advance and attack enemy towers, structures that spawn units or attack enemy units or special powers which can be used to perform damage, among other things. Cards cost energy that regenerates over time (to a maximum). I recommend it since it is a great game, and it is really really polished in every detail (including multiplayer). Since the game is very competitive, they probably have an authoritative server to validate player actions to avoid cheating. For example, a Player could say “I played card X” to the server, the server has to validate the player had that card in hand to use it, and enough energy. In each game there could be several units at the same time (like 30 units in the worst case), also, there are tons of games being played at the same time. In order to make the game run over mobile networks and to support all those games, with all those units at the same time, they have to reduce the bandwidth to the minimum. One strategy could be to compress the data sent, other could be to send data not so frequent and to interpolate to be as smooth as possible. However, considering that each unit has a position, looking direction, target, health, animation frame, among other stuff, that could still be a lot of data. I am guessing here that they follow another approach like a synchronized simulation of the game in each client and, since it is not so CPU heavy, every mobile device nowadays (game was released March 2016) shouldn't have problems running the game logic. Another thing that made me think about synchronized simulation was that every player action is not performed instantly, it has a small delay or a cast time. That could be a design choice but I believe it considers the fact that actions must be synchronized between players and having a delay allows them to do that. If they are simulating in the client, they have to control the simulation to be deterministic or they must have some way to fix the game state if it was desynchronized at some point. If I remember correctly, they follow an approach that the game never stops, players could be disconnected for a while and then reconnect and continue playing, they just lose part of the game (couldn’t perform actions). That could be used also for player desynchronization. Don’t know the resynchronization strategy but maybe the server sends game state snapshot and the player continues from there. They even have game replays, so I am guessing that simulating the game in each device could help in reducing the cost of watching a replay even though they could replay it in a server if they want since they probably have tons of servers :). My guess is that the game has a client/server architecture where both the server and the client simulate the game synchronously. The server is in charge of validating player actions and responsible of deciding the real game state in case of desynchronization. As I said at the beginning of the blog post, this is a superficial analysis based on my current knowledge. If I wanted to perform a deeper analysis I could have follow another approach like doing some reverse engineering over the game connections to validate some of my guesses but that wasn't the blog post purpose.